Today’s ghost town was both the name of a Wasatch Mountain pass in Utah and the town which was founded at the top of the pass early in the twentieth century. In 1776 the area was discovered by Francisco Atanasio Domínguez and Silvestre Vélez de Escalante, Franciscan priests, who trekked through the area on their way to present-day California. The name Soldier Summit originated in 1861 when a group of soldiers commanded by General Philip St. George Cooke crossed the pass on their way to join the Confederate Army. 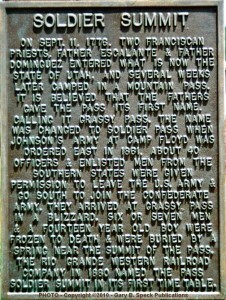 Caught in a snow storm in July of 1861, some of them died and were buried on the summit. Following the Civil War, expansion continued as gold, silver and coal were discovered across the West. Railroads, small and large, were built throughout the region to transport massive quantities of mined materials. The Soldier Summit railroad line was opened by the Utah & Pleasant Valley Railway to transport coal from newly opened mines in Scofield, with a narrow-gauge railway added in 1877 to connect to the Utah Southern Extension Railway. In 1882 the Denver & Rio Grande Western Railway (D&RGW) purchased the U&PV with plans to continue their route to Grand Junction, Colorado. They upgraded the tracks and a new narrow gauge route took the line over Soldier Summit, a climb of four percent grade. In 1890 the line was converted to standard gauge after D&RGW became Rio Grande Western. The four percent grade heading up to Soldier Summit was a bottleneck, and in 1913 fourteen miles of new line was built between Detour and Soldier Summit. Today that four percent grade route is part of US Highway 6 between Detour and Soldier Summit. Over the years the railroads continued to improve, realign and relocate their routes. 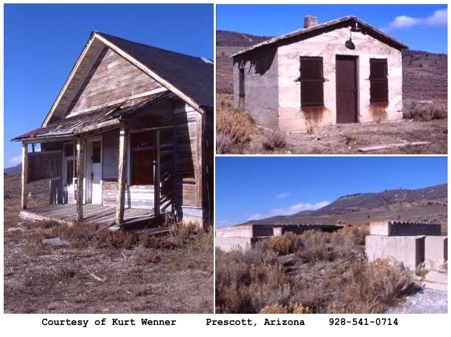 One relocation led to the obliteration of the mining town of Thistle in 1983 – you can read about it here in a recent ghost town article. A division is the portion of the railroad under the supervision of a superintendent. A subdivision is a smaller portion of a division. A subdivision is typically a crew district or a branch line. A division point is just a big yard at one end of the division or another. A regional railroad is basically a cast off portion of a former class one. Division points were important back in the steam era days. Trains would run from division point to division point and completely reswitch and change engines at each division point. Real estate developer H.C. Mears surveyed the town site, began selling lots and the town was incorporated in 1921. People came to work in the railroad machine shops and growth continued as stores, hotels, restaurants, saloons, churches and a school were built. A branch of The Church of Jesus Christ of Latter-Day Saints was established on June 21, 1921, and by 1927 there were enough Mormons living there to organize a ward. Between 1925 and 1930, the population peaked around twenty-five hundred. Railroad towns, like mining towns which disappeared after mines were depleted, became virtual ghost towns based on the decisions of corporate executives. The railroad realized that the high cost of doing business in Soldier Summit, not to mention the harsh winters, was not cost-effective. 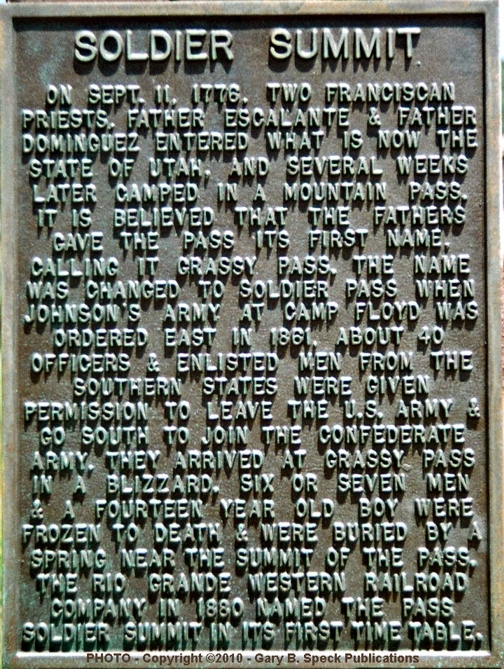 In 1930 the division point was moved to Helper and Soldier Summit began to decline. The town still contributed to the rail line until diesel engines were introduced and the grade was reduced from four to two percent – there was no longer a need for helper engines. In January of 1930 the LDS ward was downgraded once again to a branch. By 1949 the school’s enrollment dropped to just eleven students, although it remained open until 1973. In the late 1970’s there were still a handful of residents and four part-time police officers, but the town was totally disbanded in 1984. Today only a gas station, empty houses and crumbling foundations are all that remain. Nice storyline.. I would like to hike the area now, after reading your article. Thank you! I very much like your story. Thank you very much! You are so welcome … thanks for stopping by! Hello! Why the station was named Detour? Do you know of any more odd history of Wasatch county? I’m doing a report and would like to include some little known history.